It is getting harder for us to imagine what you would look and act like now as I know you would have changed so much from a tiny newborn. I imagine your hair looks different and that your entire little face and body has just grown and changed so much. I wonder if your hair has lightened up and if it is more blonde like Mommy's and Brody's or if it has some red in it like Evan's and Daddy's. I know that this month you would likely be sitting up and playing more and may even be attempting to crawl. I think this may have been our most difficult month without you because after the Christmas rush was over, things around here slowed way down and left us with more time to think about you. In the past couple of weeks, our family has been through so much with your Nana being very sick. 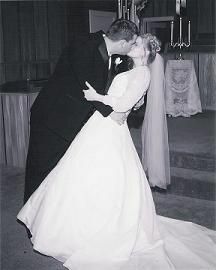 If you get to meet your Nana soon, I hope that you two will love each other and keep one another company until we are all together again. She took good care of your Mommy when she was a little girl, and I know she'll do the same for you. Although this was a slower month for us all with some very cold weather, I know you would have enjoyed experiencing some fun things with us all like your first snow day and your first trip to the circus. Your big brothers had a blast! Mommy found this little outfit last winter at Gymboree and knew you just had to have it. I really hope you would have liked bunnies because you would have been wearing them a lot! Mommy would have loved shopping for you and thinks you would look cute and be warm and cozy in this little pink sweater outfit with penguins on it from Janie & Jack. And the matching cardigan too! And you would have definitely needed a nice warm hat to wear in your first snow. And some nice warm pants to match! 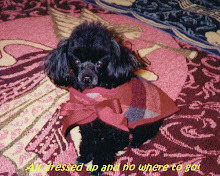 And because a girl needs something besides pink, you would have looked ravishing in this little purple dress at church. With a little matching cardigan sweater. 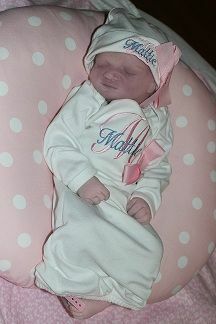 We love you and miss you, sweet baby girl! You will never be forgotten! Last month was such a busy month. Brody went to two birthday parties for his school friends, but I never got around to posting pictures. Both parties were at My Gym (different locations). Apparently, this is the place to go for preschool parties. Haha! I have never done a My Gym party though, but we have been to many. Brody really seemed to enjoy himself more, and Evan even joined the fun at the second party. It has been so long ago, I can't even remember what he and Daddy did while we were at the first party. I think they went to the mall to do some Christmas shopping. The first party was for Madeline whose mother is teaching her and her older siblings french from a very young age. I love hearing her talk to them. Madeline is obviously very decisive and wanted to wear her pink leotard and tutu and have a pink princess cake. I guess girls really know what they want at 3 years old! We enjoyed a little snack before play time at this party. Brody seemed to enjoy this location a lot, and I think he liked that there were less kids. Just enjoying a few goldfish and waiting for cake. Madeline sitting with her older sister and brother. The sweet little cake her mom made. She added some fluffy pink cotton candy for the dress. Sweet boy. He isn't a big cake fan, but he did seem to enjoy this strawberry cake and icing. He really loved the ball pit. This party was on Sunday afternoon so Brody was dressed in his church clothes. He was feeling adventurous and tried all the little obstacle courses. Coming through the tunnel and had to walk the plank. Walking the little bridge to the ball pit. Mommy catching him as he emerged from the tunnel. Having a jumping good time with his buddy, Sammy. Working his way through the little maze. Trying to get all the kids to pose for a picture with the birthday girl in the ball pit. Brody was in a picture taking mood. He loves when I roll him around in the little barrel. He decided this looked like a nice place for a rest. And he started a trend. He even zoomed across the zipline. And loved the always popular alligator puppet story. And then it was nap time! The second party was for a little man named Miles who loves Cars. This party felt like a little kick off to Christmas party and was a chance for our boys to let loose a little after a stressful day of shopping with Mommy. There were quite a few kids at this party, and Brody was feeling more shy. He did like having big brother with him. I thought he would do the zipline again, but he was not in the mood. He had to be coaxed to do this "sledding" obstacle. Big brother encouraging him at the end. I let Evan get in on the fun although he was older than the other kids because he is good about being gentle with little ones. Still happiest in the balls. Having a little snack and taking a break. Singing happy birthday to Miles. Evan showed Brody how to do the zipline (still making up for not doing this when he was younger...haha!). I am thankful January has been a slower month with less events so that I can finally get these last posts finished. Eddie: I guess he could do a better job typing up this one. He is back at work and still doing a wonderful job caring for us all. He gets the boys up in the mornings and ready for school, prepares their breakfasts and packs lunches, and gets them off to school. Yes, he does the majority of these daily tasks as I am not a morning person. He gets home before me in the evenings and proceeds to cook dinner except on Tuesday nights when Evan has basketball practice, and we grab a bite to eat somewhere after practice. This wonderful and amazing man also celebrated his 36th birthday last Tuesday by taking his son to basketball practice, picking up his own cupcakes, and having a late dinner with all of us and the kids at McAlister's Deli (kids eat free on Tuesday nights so it just makes sense to go there after basketball practice). I really need to plan something extra special to celebrate his birthday. Sigh. He has also embarked with me on our joint resolution to get healthier by being my workout partner in the mornings (when he can drag me out of bed...haha!) and by attempting to eat healthier. Me: I have been getting home around 6:30 most nights, and I hate driving home in the dark. Most of our evenings involve eating dinner, getting the kids bathed, and then maybe cuddling on the couch or our bed and watching a television show or reading a story before bedtime. It has been pretty chilly most nights, and our upstairs is warmer than our downstairs (our house only has one heating unit to heat upstairs and down and hot air rises, of course) so we spend a lot of our evenings upstairs where it is warmer. Unfortunately, our bed is too comfortable, and I get sleepy pretty early so my evenings are pretty short. 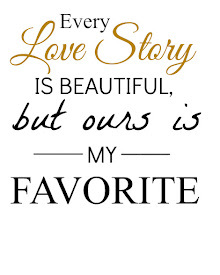 On Friday nights and the weekends, we try to make up for lost time during the week spending time together. I have also been reading a lot lately as I am about halfway through one of the books I wanted to read for a while now (The Atlantis Plague which is the sequel to The Atlantis Gene which are the first two books by a new author that I discovered last year). I am also attempting the pursuit of the healthier lifestyle. We have been trying to eat healthier food options cutting out as much processed food and yucky additives while eating more fresh fruits and veggies. We purchased a juicer as a late Christmas present and are attempting making our own juices (primarily green juices to help us get some extra green goodness into our diets). I just need some extra motivation to stay on top of these goals and mostly need to cut back on my favorite beverage, sweet tea. Haha! Anyway, as I stated, this is the most boring post ever as nothing really exciting is happening although I think that will likely change all too soon. Evan: Evan is back to school and loving it although his beloved teacher did not return to school after the Christmas break, and his school is seeking a replacement teacher for his class. One of the students' moms is actually their substitute so I feel confident they are in good hands, but we are concerned about the long term plans for his class. Before Christmas, I knew I wanted to work on getting Evan reading some books that he could truly enjoy now that he is reading so well. He was still bringing home little short books that he would read quickly but didn't really seem to get a whole lot of enjoyment out of. Once he got his Christmas present (his very own Kindle Fire), I purchased the first books in the Magic Treehouse series for him to begin reading. They are early chapter books and are filled with wonderful adventures that take children to neat places and periods in history. He loves them so much and has already read the first 10 books. At this rate, we'll be looking for a new series in another couple of months (there are 51 books in this series). Evan is very self-motivated so now that he has books he loves reading, I really don't even have to encourage him to do so. He just wants to read now all the time. I am positive he has logged in more reading time than screen time in the last few weeks so that makes me very happy. Evan has also been playing basketball for a local church league. He scored his first goal in the second game of his life so we were pretty proud. We'll share more on that soon. Brody: I don't know where to begin with this little man. He is just growing and changing every day. He is getting very sharp, and we love hearing him talk more and more. We can understand nearly everything he says these days as he puts together coherent sentences more and more. "I eat," "I help," "I want car," "I want juice," "I poop," "Mommy, look," "Daddy, sit," "It's my turn!" (usually said when he wants the kindle or phone, or "tone" as he calls it, someone else has), "I want sweet tea" (yes, he is addicted too! ), "There's a tree!" (said excitedly as he points to every tree he sees including all the Christmas trees during the holiday season. We might have another forester in the making. Haha! ), etc. He likes to tell us to sit beside him or sit in our places in the car when we are going somewhere. He likes to show us things, especially his "toot toots" or "tucks" and "cars" he sees out the window. I think we also discovered that his favorite color is blue. I love that he is responding so well to our questions now and just have the best time carrying on little conversations with him. I feel like I am finally getting a real peek at his fun little personality. 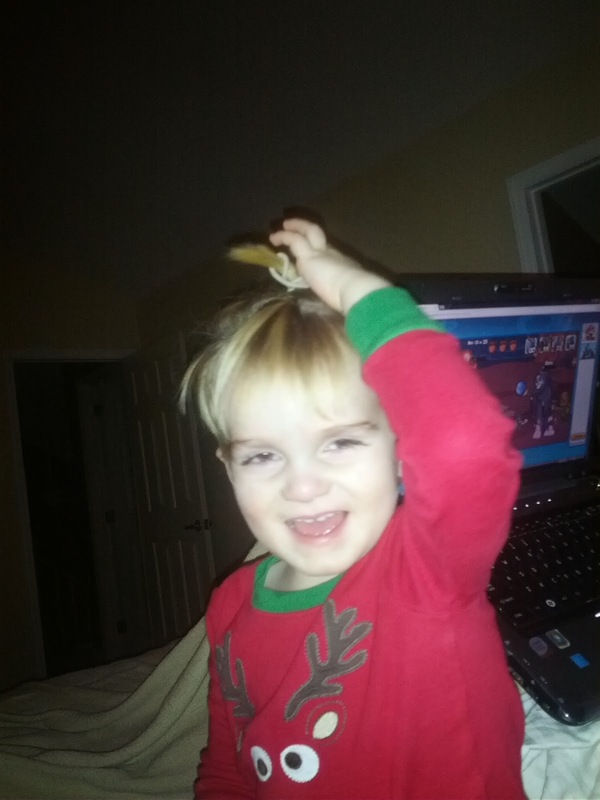 I think he has also decided that his favorite Chuggington character is "Puffer Pete" as he loves saying his name. He is still singing his favorite tune from Christmas, Little Drummer Boy. Mostly, he likes singing the "Pa Rum Pa Pum Pum" parts. I also discovered that someone lets him listen to "What does the fox say" which I had never even listened to until last night (I know I am a bit behind, but it sounded so stupid that I was not even remotely interested in checking it out but my curiosity got the better of me. I was rewarded with hearing the dumbest song I have ever heard in my life so thanks a lot for that, people. Haha!). Brody heard it and immediately started dancing and even "sang" some of the animal "sounds" from the song. No, I was not really proud. I blame the nanny. So anyway, we are all still here and doing well. Since no post can be complete without a few pictures, here are just a few that I have taken on my phone recently. Brody wanted Mommy to give him a new hairdo. Ha! The boys shared some nice relaxing days after Christmas before returning to their school schedules. 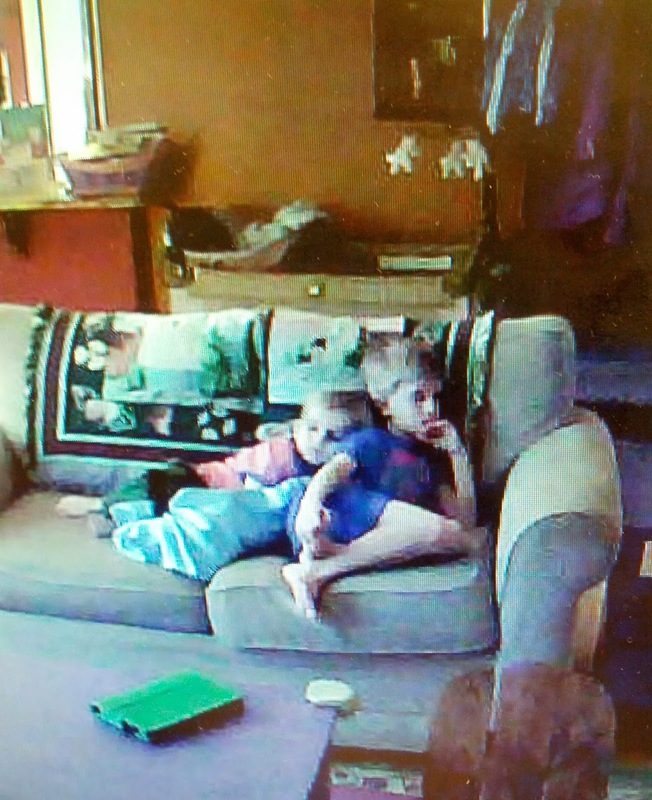 Brody was enjoying cuddling up on his big brother as I watched from my desk at work using our "nanny cam." 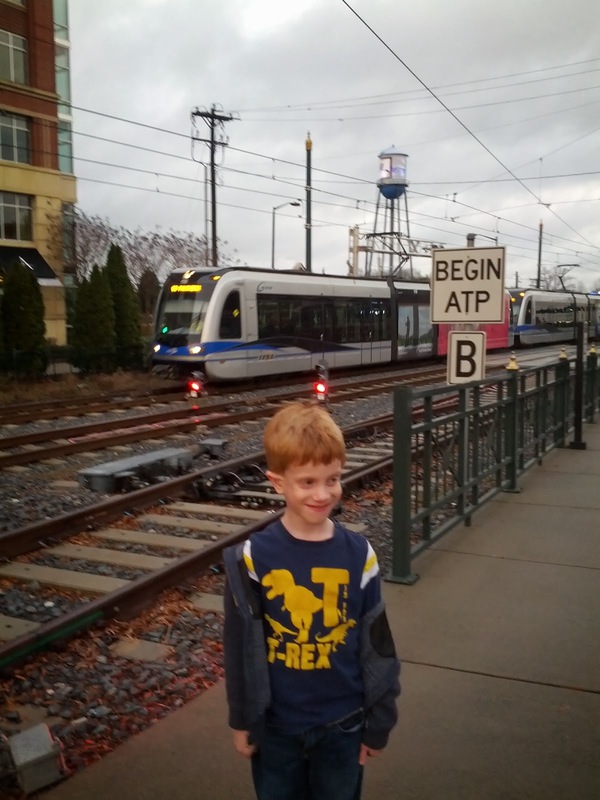 We ate lunch this Saturday at a cute little place next to the railroad tracks where our city's light rail train passes by frequently carrying passengers to and from the center city area. Brody would have loved to be in this picture as he loves watching the trains, but he had already been put into his car seat when the train was coming by. 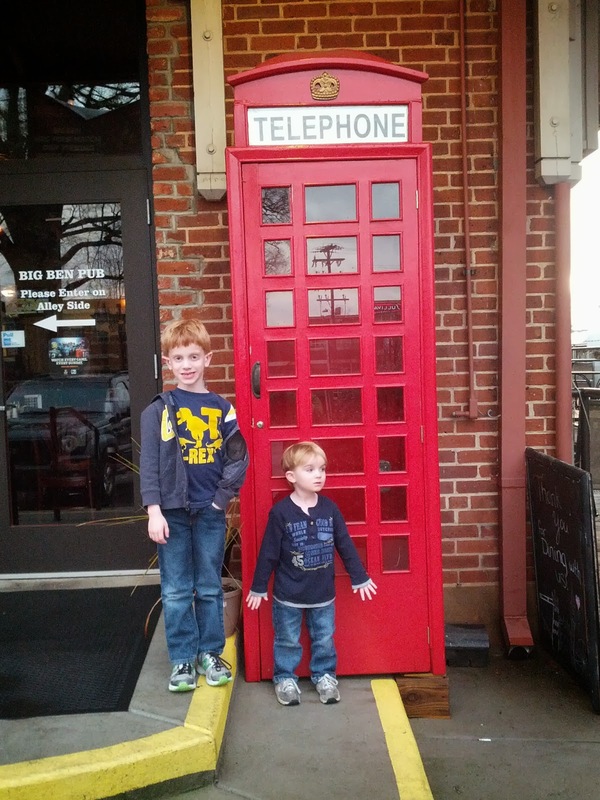 The boys liked this British looking phone booth outside the English themed pub restaurant where we ate lunch. I wish I could hop inside and take a trip to the Ministry of Magic in Harry Potter's world. Haha! Sorry I stole some of your precious time in reading this completely pointless post. I'll try to put together something more meaningful soon.